Europe and the Near East as far as Iran, Africa, America, Australia and New Zealand. Bitter principles, caffeic acid derivatives, flavonoids, hydroxy coumarins, inulin and pentosans. If you go looking for chicory when the weather is cloudy or during the afternoon, you may well miss it. Where bright blue flowers line the paths during sunny hours only rough, tough, hollow, hairy stems are to be found on dull days or in the afternoon. These rigid stems may grow to be a metre high, but their leaves are so inconspicuous that the whole plant is nearly invisible to the observer. Only at ground level do the leaves fan out in rosette form and resemble their relatives, the dandelions. So where have all the flowers gone? 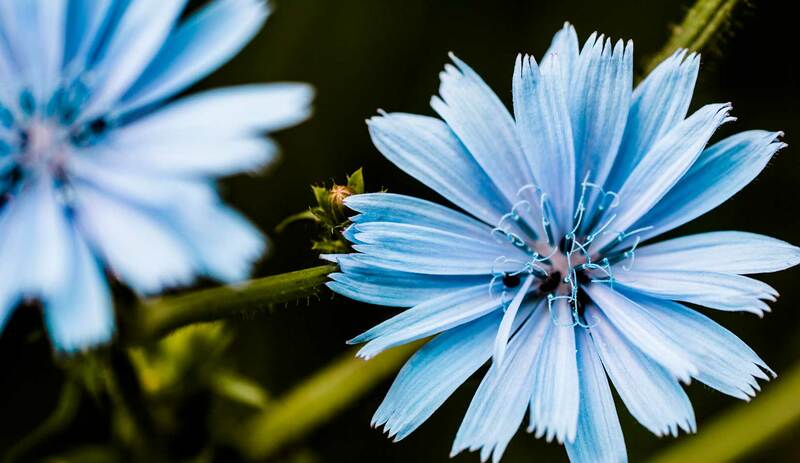 Chicory opens its bright blue, and occasionally pink or white, flowers from July to September, but only in the morning and only when the sun is shining. The flowers turn their heads to the sun. They blossom for just one day, and then close so tightly that they look like extensions of the tips of their stems. Chicory can be reliably identified by its bitter milky sap, which runs through the whole of the plant. With its long, spindle-shaped root, which anchors it in the ground, this plant loves heavy clay soils and is commonly found by the wayside and on banks and fallow or waste land. Chicory root contains bitter substances which aid digestion and fortify. It is beneficial in cases of loss of appetite and dyspepsia, gallbladder and liver complaints. Digestive disorders and skin impurities often go hand in hand, so if ingested as “children’s coffee” or used externally in the form of washes, chicory also aids in the treatment of blemished skin. In pre-Celtic times chicory was a highly revered sacred plant regarded as the plant embodiment of the vegetation goddess, the daughter of Mother Earth. The sun god, son of the high heavens, was her spouse. With her blue eyes, Chicory was constantly watching for her beloved and turning towards him. The Greeks held a similar view. For them chicory was the nymph Clytia, beloved of Apollo the radiant sun god, who languished and died when her love was unreturned. Chicory was looked on as the symbol of faithful love, often connected with waiting in vain. Many fairy tales and legends pick up on this image and turn Chicory into the bewitched young maiden who would rather spend her life as a little flower by the wayside than renounce her beloved, who has ridden away to Jerusalem to the Crusades. Young girls would pluck chicory buds and place them in their bodices. If the flower opened it meant that the longed-for young man would surely come. A somewhat more complicated procedure involved digging up a chicory plant on St Peter’s Day (29 June) using a stag's horn. It had to be a piece of stag's horn, because the chicory was only to be touched by sun symbols. The stag symbolises the sun god in animal guise. If the chosen one came into contact with a plant dug up in this way, he or she inevitably burned with love for the one who did the digging. The rare white chicory flowers were thought to possess great magical powers. Their roots were said to protect against all dangers and harm and to make their bearer invisible. Placed under the linen shawl of a pregnant woman the white flowers were supposed to make the birth easier; powdered and mixed into a husband’s food they were thought to stop him straying. Christian mythology classified chicory among the gall-like bitter herbs that symbolised Christ’s Passion. Since chicory opened its flowers only between five and eleven in the morning, Carl von Linné (1707 – 1778) included it in the Floral Clock which he had established in the Botanical Garden at Uppsala. It is worth mentioning that this rhythm is disturbed in today’s Western Europe, possibly due to interference from electromagnetic fields. In contrast, in very rural areas of Southern Europe, for example, this relationship to the sun can still be readily observed. Chicory root can be made into a coffee substitute itself known as chicory. In the second half of the 19th century its use was widespread and it was also used to stretch real coffee, which was excessively expensive at the time. In its cultivated form the endive, chicory tastes delicious in salads. It is encouraged to shoot while covered over, indoors, in the winter. The lack of light gives rise to shoots that are very pale green and less bitter. Chicory completes the composition of Dr.Hauschka Clarifying Intensive Treatment (age 25+) and Soothing Intensive Treatment.